He allegedly then went to the capital, Gaborone, stole a KingAir 200 aircraft and flew it into the clubhouse with the intention of killing everyone there, as well as himself. 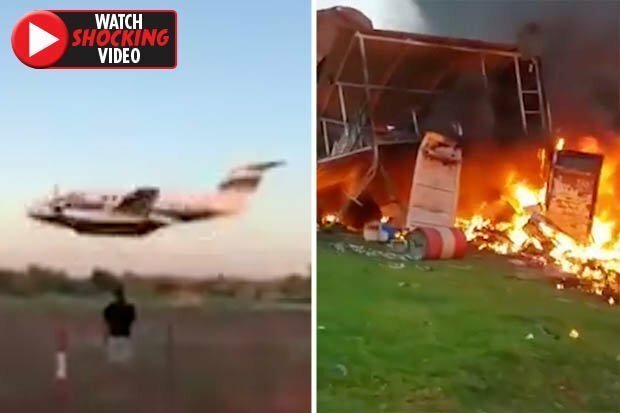 A pilot died in a horrific fireball after crashing a plane into a club in Botswana in an apparent bid to kill his wife after a row. The club added that they believed the pilot 'had no permission to fly the aircraft involved'. "The final extreme low level run by the aircraft along runway 36 resulted in an impact with the Matsieng Flying Club facility at ground level". Both the clubhouse and the air traffic control tower were destroyed in the crash, according to the Matsieng Flying Club. There were 13 vehicles also destroyed by the blaze. There was no serious injury to any person in the vicinity of the accident scene. Below is footage of the plane moments before the crash (WARNING: All video footage below contains instances of strong language). The pilot was later certified dead at the Deborah Retief Memorial Hospital. TimesLIVE is aware of the name of the pilot but there has been no official confirmation of his identity by police in Botswana. He is said to be from South Africa. Botswana Civil Aviation Authority flight operations inspector Phemelo Chominyana confirmed that the incident had happened on Saturday but said by phone that he had no further details. It's unclear if Viljoen's wife was one of them. The couple had attended a stork party at the club and had ostensibly had an argument, and other guests had told a drunk Viljoen to leave, Netwerk24 reported.